...and this little piggy stayed at home. Which is right where this little piggy will be staying as Amy has nabbed her! 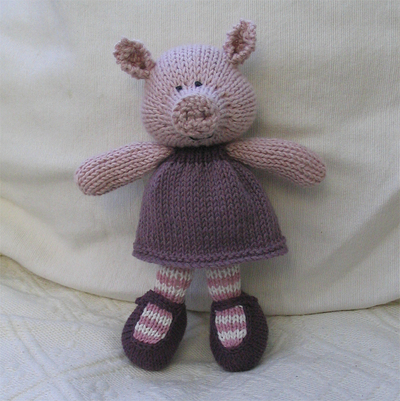 I was seized by an unyeilding desire to knit a pig on tuesday (strange life I lead!!) so this is my prototpye piggy and once I've sorted out the snout (I'm not fully happy with the end) then I will hopefully be making a few more. 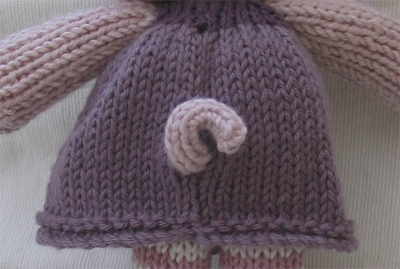 I am pleased with her squiggly tail though! 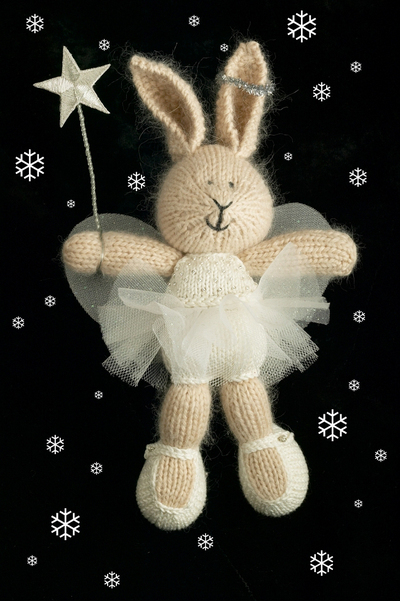 And talking of knitted toys I was really excited to hear from Carolyn, Suzie and Liz that some of my bunnies are in a new book just out called Home by Anita Kaushal. I recognise them as coming from a batch that I sold around 2 years ago to The Cross in London's Holland Park. 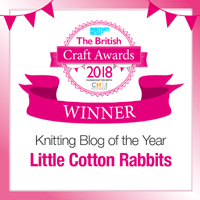 Before I started the blog and got all of the wonderful feedback about the exciting lives of my toys in their new homes I had already made around 180 rabbits. Many of these went to rather posh outlets and it does make me wonder where they all are now. It's nice to see these two again and in such a chic and stylish home - I hope they remember their humble beginnings! Happy weekend to you all and especially to Laura at Cupcakes for Clara who is getting married tomorrow! 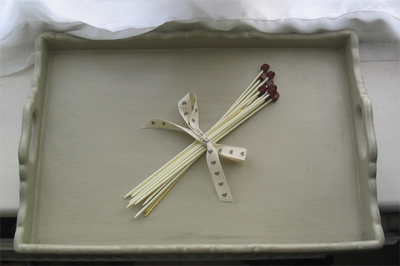 PS: The lovely Marie is having a wonderful 100th post giveaway at Marie Chantal. 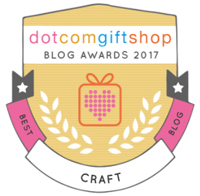 You'll have a wonderful time choosing between her gorgeous products if you're the winner, so to be in with a chance pop over and leave a comment. ... there's some fantastically soft Lousia Harding Kimono Angora sent to me a little while ago by the lovely Michaela which is in the process of being turned into a scarf. 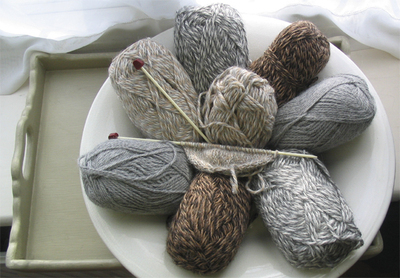 ... and some beautiful new marled Alpaca Select that I've just received from wonderful wool shop First4yarns which is being transformed into new bunnies. 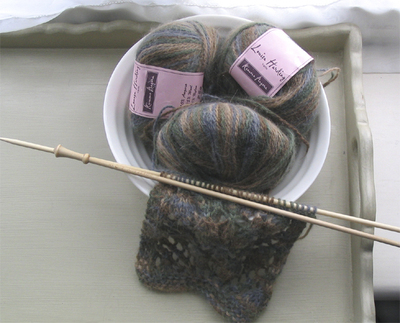 And to do all of this knitting I've been using my new set of ivore swallow needles (made from casein - a lovely light and flexible plastic) recently bought from Dragon Yarns. So, bring on the rain! Oh, and by the way if you need a little cheering up, pop over to Sewchristine as she's having a lovely give-away competition and you might just win yourself something to brighten up your week! There are lots of things I'm really behind with at the moment (like replying to emails and taking up tags - sorry Lesley I've not forgotten!) 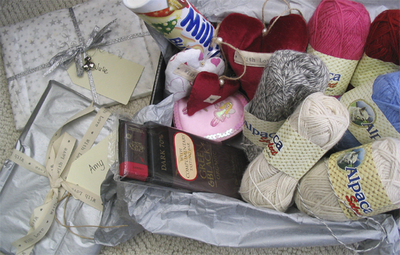 but I wanted to make time to publicly thank Jill (author of the Little Cotton Rabbit story) who recently sent me such a lovely parcel full of wool and goodies. 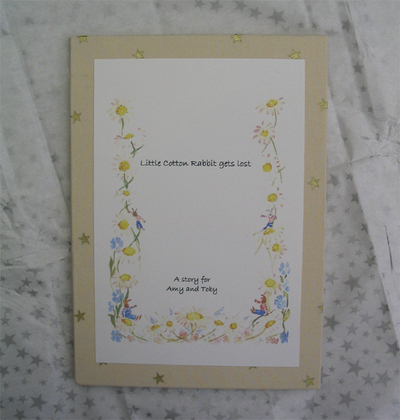 and included in the package were two bound copies of the book for Amy and I each to treasure. He's got the measure of me! He may be autistic but my son knows me all too well. He knows that it's no good just trying to pull me upstairs to play bounce-on-the-bed while I'm in the middle of making tea. But taking my knitting bag as a hostage is guaranteed to get me following! What a tinker! Thanks to everyone who visited my shop last night. The latest batch of toys will be winging their way to their new homes shortly. I wanted to make some postcards of this seasonal batch but once again time has got the better of me. 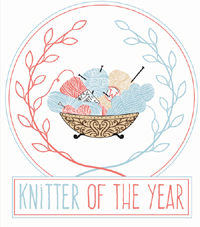 But then I heard on the blog grapevine that those lovely people over at moo have come up with a wonderful idea. They are offering greetings cards that help raise money for Médecins Sans Frontières. A pack of 10 cards costs £9.99 ($1 goes to the charity) and you can easily personalise them so that your card says exactly what you want it to. You can either print the cards from your own images that you upload to flickr or choose from thousands on file at the people powered card store. Or you could choose this one! 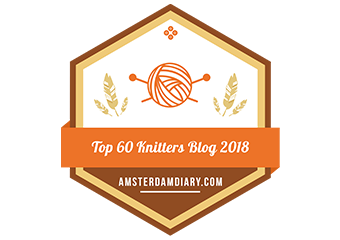 And if this has got you in a seasonal mood and you're a knitter then you should pop over for a visit with DottyCookie who has created the sweetest little christmas pudding patch to knit. 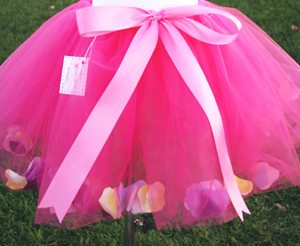 The lovely Nathalie at Kennedy and friends has made this beautiful tutu to auction off for the Rose Willcocks fund. Made from the finest quality tulle, satin ribbon and silk rose petals it would make the most perfect Christmas pressie for a budding ballerina or little Princess (aged 2-6 years). Bidding has just started and will end on November 25th so if you pop over now and place a bid you'll be making 2 little girls very happy ones this Christmas!